Rheumatic heart disease is cardiac inflammation and scarring triggered by an autoimmune reaction to infection with group A streptococci. In the acute stage, this condition consists of pancarditis, involving inflammation of the myocardium, endocardium, and epicardium. Chronic disease is manifested by valvular fibrosis, resulting in stenosis and/or insufficiency. The average annual incidence of acute rheumatic fever in children aged 5-15 years is 15.2 cases per 100,000 population in Fiji  compared with 3.4 cases per 100,000 population in New Zealand,  and it less then 1 case per 100,000 population in the United States. Although rheumatic fever was previously the most common cause of heart valve replacement or repair, this disease is currently relatively uncommon, trailing behind the incidence of aortic stenosis due to degenerative calcific disease, bicuspid aortic valve disease, and mitral valve prolapse. See Rheumatic Heart Disease and Rheumatic Fever for more information. Rheumatic fever is a late inflammatory, nonsuppurative complication of pharyngitis that is caused by group A-hemolytic streptococci. Rheumatic fever results from humoral and cellular-mediated immune responses occurring 1-3 weeks after the onset of streptococcal pharyngitis. Streptococcal proteins display molecular mimicry recognized by the immune system, especially bacterial M-proteins and human cardiac antigens such as myosin  and valvular endothelium. Antimyosin antibody recognizes laminin, an extracellular matrix alpha-helix coiled protein, which is part of the valve basement membrane structure. The valves most affected by rheumatic fever, in order, are the mitral, aortic, tricuspid, and pulmonary valves. In most cases, the mitral valve is involved with 1 or more of the other 3. In acute disease, small thrombi form along the lines of valve closure. In chronic disease, there is thickening and fibrosis of the valve resulting in stenosis, or less commonly, regurgitation. T-cells that are responsive to the streptococcal M-protein infiltrate the valve through the valvular endothelium, activated by the binding of antistreptococcal carbohydrates with release or tumor necrosis factor (TNF) and interleukins. A study reported that the increased expression of Th17 cell-associated cytokines might play an important role in the pathogenesis and development of rheumatic heart disease. The acute involvement of the heart in rheumatic fever gives rise to pancarditis, with inflammation of the myocardium, pericardium, and endocardium. Carditis occurs in approximately 40-50% of patients on the first attack; however, the severity of acute carditis has been questioned. Pericarditis occurs in 5-10% of patients with rheumatic fever; isolated myocarditis is rare. Rheumatic heart disease is the predominant cause of mitral stenosis. A history of rheumatic fever can be elicited from approximately 60% of patients presenting with pure mitral stenosis. There is a 2:1 female-to-male incidence. In developed countries, the disease has a latent period of 20-40 years, with another period of almost a decade before symptoms require surgical intervention. Rheumatic heart disease is currently an uncommon cause of aortic stenosis, occurring less frequently in developed countries than senile degenerative calcific aortic valve disease, and degenerative bicuspid valve disease. Most patients have concomitant mitral valve disease. Rheumatic heart disease is also an infrequent cause of aortic insufficiency in developed countries, less common than aortic root disease and endocarditis, depending on the patient population. 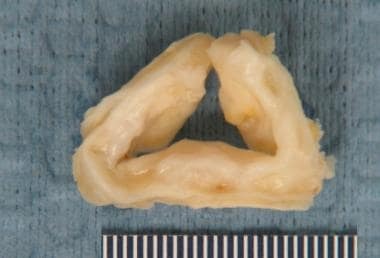 Pure aortic stenosis is caused by postinflammatory disease in 9% of patients with surgical treatment, compared with 14% of patients with pure aortic insufficiency and 17% of mixed aortic insufficiency and stenosis. The clinical features of aortic stenosis and regurgitation are similar to those of other pathologic causes. In the acute phase, verrucous endocarditis consists of small, uniformly sized thrombotic vegetations that do not produce valve destruction. The chronically scarred, inflamed, and neovascularized valve is most commonly encountered by pathologists. Chronically, rheumatic fever leads to commissural fusion, valve thickening, and calcification. The appearance of the mitral valve with shortened, fused chordae and scarred commissures has been likened to the mouth of a catfish (fish-mouth deformity). There is also diffuse scarring of the aortic valve, with commissural fibrosis and thickening of the leaflets. Postinflammatory or postrheumatic valve disease is generally diagnosed at the time of surgery by gross inspection of the valve by the surgeon (see the following image). In the case of mitral stenosis, there are few conditions in the differential diagnosis. Aortic stenosis is more frequently caused by calcific valve disease, approximately half of which occur on congenitally bicuspid valves. Nodular calcific stenosis is characterized by calcific deposits in the sinuses of Valsalva, with relative sparing of the valve's free edges and commissures. Postinflammatory mitral disease, autopsy. The mitral valve is seen from the atrial aspect. The chordae tendineae are markedly thickened with chordal fusion. The glistening white appearance is caused by fibrosis. In contrast, postinflammatory aortic stenosis typically involves the leaflets, free edges, and commissures, with fibrosis and little calcification (see the image below). Mitral insufficiency caused by postrheumatic valve disease may be somewhat difficult to distinguish from mitral valve prolapse, but the presence of chordal fusion, thickening, and shortening typically separate postinflammatory disease from mitral valve prolapse with its thin, elongated cords and translucent, glistening leaflets. Postinflammatory aortic disease, resection. The stenotic aortic valve is difficult to repair and is generally replaced. In this example, there is diffuse thickening and scarring of the valve. In contrast to noninflammatory degenerative stenosis, there is significant commissural disease, with thickening of all 3 commissures. Acute vegetations of acute rheumatic fever show valve leaflets with surface thrombi, lack of underlying valve destruction, and mild edema and chronic inflammation. Chronically, rheumatic valve disease is characterized by neovascularization, chronic inflammation, and relatively mild calcification. In contrast to annular calcification, the calcium is in the leaflet itself. Histologically, neovascularity is common in postrheumatic valve disease, but this is not a feature of uncomplicated mitral valve prolapse. Significant inflammation is uncommon in rheumatic valve disease in the chronic phase, but there is generally no inflammation in myxomatous valve disease. In general, the diagnosis is made by the gross appearance of the valve, with clinical history and adjuncts in diagnosis. Aschoff bodies are specific for postrheumatic carditis, whereas Anitschkow cells can be seen in a variety of conditions. 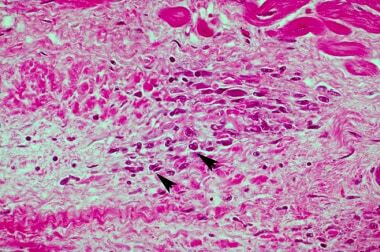 In fact, Aschoff nodules are considered pathognomonic for rheumatic heart disease; these are interstitial fibroinflammatory lesions with macrophages and collagen necrosis (see the first image below). Anitschkow cells, which have unusual wavy nuclear outlines, are called caterpillar cells and are typically present, but they can also be seen in other conditions not in association with Aschoff nodules (see the second image below). Aschoff nodule. 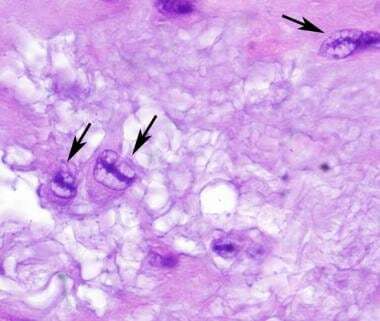 The acute phase of rheumatic heart disease, or rheumatic carditis, is characterized by the Aschoff nodule, which is an interstitial aggregate of macrophages and lymphocytes, with necrotic collagen, in an area of interstitial fibrosis. Anitschkow cell. In the center of Aschoff nodules are Anitschkow or caterpillar cells, characterized by linear condensation of nuclear chromatin with undulations reminiscent of a caterpillar (arrows). These cells are not specific for rheumatic fever but are seen in various conditions. In Aschoff nodules, the Anitschkow cells are macrophages, although the same nuclear change can occur in myocytes and other connective tissue cells. In rheumatic heart disease, CD4 and CD8 T-cell subsets are present within acute rheumatic fever valves. Major histocompatibility complex class 2 (MHC-2) antigens are expressed on vessel endothelium and valve fibroblasts. Rheumatic mitral valve disease is inconsistently reparable, and the long-term outcomes after surgical repair are not as good as for valve repair for mitral valve prolapse due to leaﬂet and chordal scarring. In addition, leaﬂet scarring may be progressive after repair. However, rheumatic mitral valve stenosis that is not associated with severe chordal fusion or shortening or with calcification may be treated with either percutaneous or open mitral commissurotomy with a high degree of long-term success. Hilário MO, Terreri MT. Rheumatic fever and post-streptococcal arthritis. Best Pract Res Clin Rheumatol. 2002 Jul. 16(3):481-94. [Medline]. Steer AC, Kado J, Jenney AW, Batzloff M, Waqatakirewa L, Mulholland EK, et al. Acute rheumatic fever and rheumatic heart disease in Fiji: prospective surveillance, 2005-2007. Med J Aust. 2009 Feb 2. 190(3):133-5. [Medline]. Jaine R, Baker M, Venugopal K. Epidemiology of acute rheumatic fever in New Zealand 1996-2005. J Paediatr Child Health. 2008 Oct. 44(10):564-71. [Medline]. Cunningham MW. T cell mimicry in inflammatory heart disease. Mol Immunol. 2004 Feb. 40(14-15):1121-7. [Medline]. Guilherme L, Cury P, Demarchi LM, Coelho V, Abel L, Lopez AP, et al. Rheumatic heart disease: proinflammatory cytokines play a role in the progression and maintenance of valvular lesions. Am J Pathol. 2004 Nov. 165(5):1583-91. [Medline]. [Full Text]. Wen Y, Zeng Z, Gui C, Li L, Li W. Changes in the expression of Th17 cell-associated cytokines in the development of rheumatic heart disease. Cardiovasc Pathol. 2015 Jul 31. [Medline]. Kamblock J, Payot L, Iung B, Costes P, Gillet T, Le Goanvic C, et al. Does rheumatic myocarditis really exists? Systematic study with echocardiography and cardiac troponin I blood levels. Eur Heart J. 2003 May. 24(9):855-62. [Medline]. Hafez M, Chakravarti A, el-Shennawy F, el-Morsi Z, el-Sallab SH, Al-Tonbary Y. HLA antigens and acute rheumatic fever: evidence for a recessive susceptibility gene linked to HLA. Genet Epidemiol. 1985. 2(3):273-82. [Medline]. Berdeli A, Celik HA, Ozyürek R, Dogrusoz B, Aydin HH. TLR-2 gene Arg753Gln polymorphism is strongly associated with acute rheumatic fever in children. J Mol Med. 2005 Jul. 83(7):535-41. [Medline]. Wallace MR, Lutwick LI, Ravishanka J. Rheumatic fever. April 13, 2009. [Full Text]. Bonow RO, Carabello BA, Kanu C, et al. ACC/AHA 2006 guidelines for the management of patients with valvular heart disease: a report of the American College of Cardiology/American Heart Association Task Force on Practice Guidelines (writing committee to revise the 1998 Guidelines for the Management of Patients With Valvular Heart Disease): developed in collaboration with the Society of Cardiovascular Anesthesiologists: endorsed by the Society for Cardiovascular Angiography and Interventions and the Society of Thoracic Surgeons. Circulation. Aug 1 2006. 114(5):e84-231. Dare AJ, Harrity PJ, Tazelaar HD, Edwards WD, Mullany CJ. Evaluation of surgically excised mitral valves: revised recommendations based on changing operative procedures in the 1990s. Hum Pathol. 1993 Dec. 24(12):1286-93. [Medline]. Dare AJ, Veinot JP, Edwards WD, Tazelaar HD, Schaff HV. New observations on the etiology of aortic valve disease: a surgical pathologic study of 236 cases from 1990. Hum Pathol. 1993 Dec. 24(12):1330-8. [Medline]. Veinot JP. Pathology of inflammatory native valvular heart disease. Cardiovasc Pathol. 2006 Sep-Oct. 15(5):243-51. [Medline]. 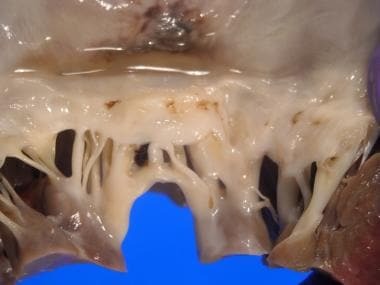 Postinflammatory mitral disease, surgical specimen. Surgical repair of a postrheumatic valve can entail valve replacement, with removal of the entire valve, or partial replacement with repair, as in this example. There is fibrosis of the valve, with a prominent crest at the line of closure, with thick chordae.